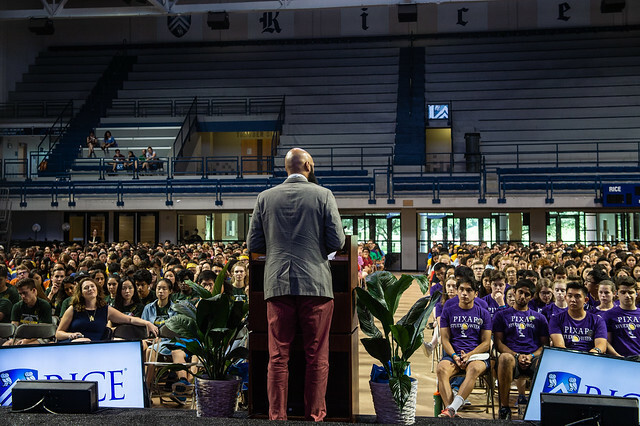 On the second morning of O-Week, Rice’s incoming Class of 2022 gathered in Tudor Fieldhouse to hear a panel of professors share their secrets for success — both at Rice and beyond. Three faculty members from three different departments delivered short, TED-style talks designed for maximum impact. “Your intellectual development is something we take very seriously,” Dean of Undergraduates Bridget Gorman said as she opened the Aug. 13 event. Part of going through college is figuring out “where you fit in and what you want to do,” she explained. Gorman encouraged the freshmen to take advantage of Rice’s broad range of undergraduate resources, from advice dispensed at the Center for Career Development to mentoring offered by the university’s 500-plus faculty members. Investing in faculty to achieve pre-eminence and providing a transformative undergraduate education are two of Rice’s goals for its Vision for the Second Century, Second Decade (V2C2). In the first talk, Fay Yarbrough ‘97, associate professor of history, opened up to the students on a personal level. Yarbrough’s parents moved her into Lovett College in August 1993. “When I came to Rice, I was really anxious and nervous,” she said. After she was accepted to Rice but before she matriculated, Yarbrough wrote a letter to her teacher, an excerpt of which she shared with the audience. The daughter of an African-American father who was drafted into the Army to serve in Korea before he could enroll in college and a Korean mother born into a large rice-farming family, Yarbrough was the only freshman in her suite receiving financial aid and would be the first in her family to receive a college degree. This experience transcends classmates and class years, Yarbrough told the students. “You might be feeling some of these anxieties right now, but I want you to rest assured that the person sitting next to you is probably feeling the same way.” And just as these pre-college jitters have a uniting effect, so too does the Rice community’s desire for excellence. As a preview, Rixner summed up his courses succinctly. “The focus of all my classes is the same: I want you to learn how to think about both problems and solutions in whatever particular domain the class is about.” These basic techniques, he explained, can be applied far beyond homework assignments or tests; these are techniques for reaching your full potential in life. Rixner, who obtained his Ph.D. from the Massachusetts Institute of Technology prior to joining Rice, holds 11 patents and the distinction of having his code used in the design of Microsoft Windows, among other applications. All of this he credits to his undergraduate education. “My undergraduate education laid the foundation that I built upon to get to where I am today in my research and teaching and generally in my career,” he said. It’s vital to spend this time engaging others and exploring opportunities, from research to service to leadership to civic engagement, he added. Matthew Hayes, assistant professor of political science, closed the talks by imploring students to develop their intellectual curiosity in a manner that will serve them throughout their lives and careers. As a freshman, Hayes was determined to become a chemistry professor, yet found himself fascinated by the questions posed in his history and political science classes. Today, Hayes is a political science professor not only because he wasn’t good at waking up for his 8:30 a.m. chemistry classes, but also because he had stumbled upon the question that truly motivated him: What do citizens actually want from government? From there, he said, he found the question that motivates his work to this day: How can democracy better serve the interests of citizens and, in particular, such traditionally marginalized groups as African-Americans? As new students, it’s natural to want to take every class, Hayes said. “But as you advance in your academic career, you’ll find that can’t learn everything — you can’t take every class that sounds interesting,” he said. “You’re going to have to focus on the questions that really motivate you.